The new director at Shakespeare’s Globe, herself an actor, wants to take the hierarchy out of theater. I’ve been reading a fascinating book about the making of Tony Kushner’s monumental Angels in America, which you may recall is a play about AIDS, the Reagan years, the awakening of gay activism, Mormons, the unscrupulous McCarthy-ite Roy Cohn, bias, love, and theater. I’m still in the beginning, where I’m learning about a 1970s political-theater group in San Francisco called the Eureka. One of its high-minded goals was to take hierarchy out of theater. That’s a goal yet to be met, or yet to be met for long, as appears from this article on Shakespeare’s theater by Mark Brown at the Guardian. “The new artistic director of Shakespeare’s Globe has promised to give more power to the casts and audiences of plays, saying she wants to dismantle theatre hierarchies. “Michelle Terry announced a new season opening with Hamlet and As You Like It. Eye-catchingly, none of the actors turning up for rehearsals will know which role they are taking, with the whole ensemble choosing who plays whom. “The first two plays will be presented by a Globe ensemble of 12 actors, two co-directors and one designer. The ensemble will decide who plays, for example, Hamlet or Rosalind. “Terry said she had chosen Hamlet and As You Like It because they were both written around 1599, the year the original Globe was built, and were conceived with its architecture in mind. Shakespeare continues to make headlines, working his magic on people from all walks of life — prisoners, refugee children, veterans, and more. Recently, New York Times reporter Laura Collins-Hughes interviewed an Army veteran who found Shakespeare helped him over a trauma and who now uses the Bard to help other veterans. Collins-Hughes writes, “Stephan Wolfert was drunk when he hopped off an Amtrak train somewhere in Montana, toting a rucksack of clothes and a cooler stocked with ice, peanut butter, bread and Miller High Life — bottles, not cans. It was 1991, he was 24, and he had recently seen his best friend fatally wounded in a military training exercise. “His mind in need of a salve, he went to a play: ‘Richard III,’ the story of a king who was also a soldier. In Shakespeare’s words, he heard an echo of his own experience, and though he had been raised to believe that being a tough guy was the only way to be a man, something cracked open inside him. “To Mr. Wolfert, who teaches controlled methods of accessing charged memories, the need to retool a lethal skill set for civilian life is a vital task that the military leaves people to figure out on their own. More at the NY Times, here. For more on Wolpert, check out a Shakespeare & Co. interview from last summer, here. 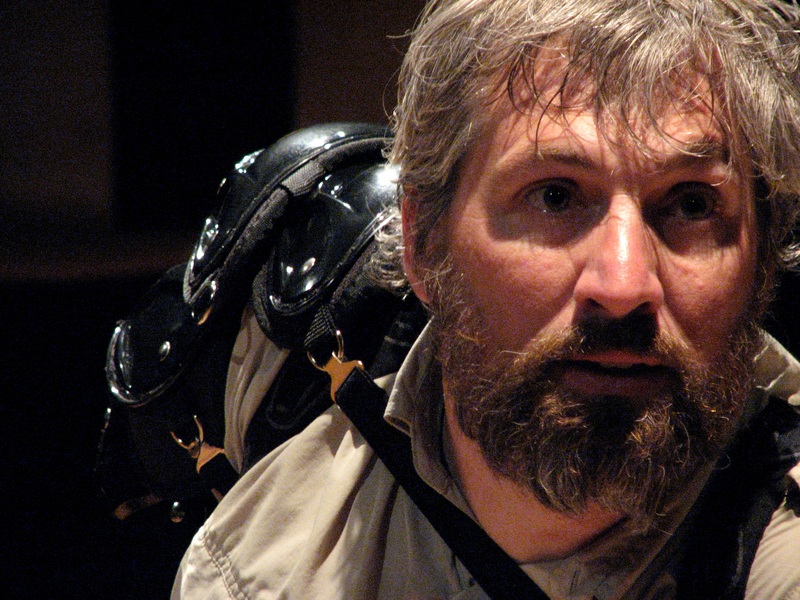 Actor Stephan Wolfert in 2014, performing his one-man show Cry “Havoc!” at the Folger Theatre in Washington, DC. The line is from Shakespeare’s Julius Caesar. Our 5-year-old grandson’s friend had been planning to attend an American Repertory Theater musical with her grandmother today at 10 a.m. We decided to go, too. The show was The Pirate Princess and was loosely (very loosely) based on Shakespeare’s Twelfth Night. It was a hoot for me, and the young man in the photo seemed riveted. But whether he could make head or tail of the convoluted plot, I have my doubts. It will be interesting to see down the road what he remembers — and whether he wants to see more plays. There were songs, musical instruments, fancy costumes, pirates storming up lighted platforms in the middle of the audience, sword fights, and imaginative special effects. I especially like the jellyfish created by glowing umbrellas with streamers, carried along the aisles in the dark. The Kraken with his many legs was pretty great, too. After the show, we had hot chocolate and cookies at the Darwin on Mt. Auburn Street. I’m not sure what our grandson will be able to tell his parents about the madcap entertainment he witnessed, but bits and pieces will likely emerge over time. I myself saw Peter Pan and Alice in Wonderland when I was four, but I didn’t become a theater nut until I was 10. Today would have been Shakespeare’s 451st birthday, and I am seeing testimonials all over Facebook and twitter. So it seems like a good day to write about the Sonnet Project in New York City. Stuart Miller wrote at the New York Times about “an ambitious project to create a short film for each of Shakespeare’s 154 sonnets, with each movie shot at a different New York City location. “ ‘It brings Shakespeare to people who might not be in touch with it, and we can use social media like Twitter and Instagram to spread the word,’ [actor Billy] Magnussen said. 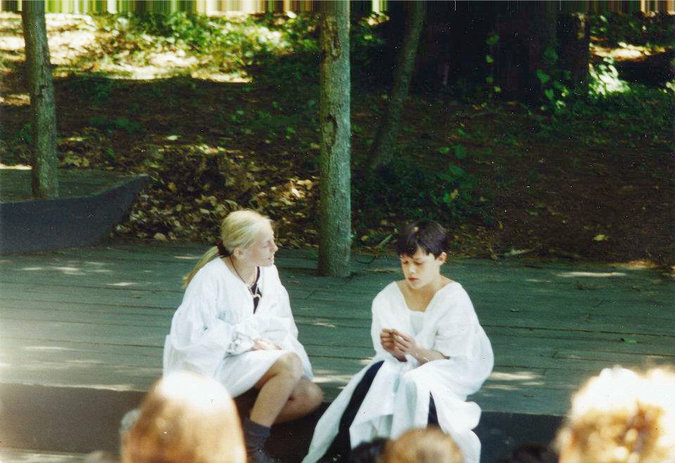 The endeavor, called the Sonnet Project, grew from the work of the New York Shakespeare Exchange, a local theater group. “Some directors found inspiration at the location where the films were shot. At Leidy’s Shore Inn, a 110-year-old bar on Staten Island, Daniel Finley, who was making Sonnet 19, filmed Laurie Birmingham, an actress who works mostly in regional theater, as a world-weary regular musing over her drink. “ ‘We walked in at 10 a.m. and the regulars were there watching OTB and scratching their lotto tickets,’ he said. ‘We learned some of their stories and Laurie based her character on those impressions.’ ” More at the New York Times, here. A crew filming Sonnet 108 at the John T. Brush stairway.